Noted CCC ski trail designer Duke Dimitri von Leuchtenberg first laid out a ski trail from the Firescrew subpeak of Mt. Cardigan in late 1933. 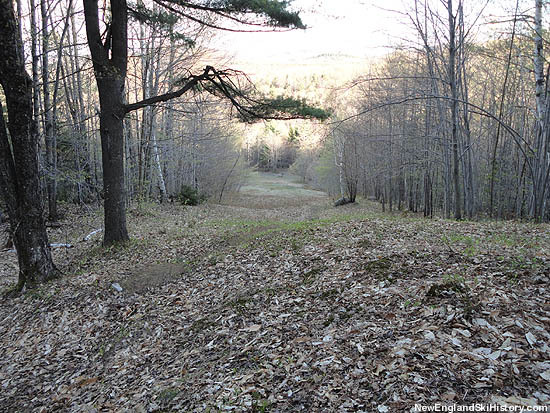 The Appalachian Mountain Club acquired over 500 acres of land on the east side of Mt. Cardigan in early 1934, naming it the Cardigan Ski Reservation. Work began on a base lodge that spring. In addition to Duke's Trail starting in 1933, the CCC also cut the Alexandria Trail (designed by Charles Proctor) in 1934. In 1935, a rope tow was added to the bottom of Duke's Trail. There would a rope tow in operation through at least the early 1960s. The AMC Cardigan Lodge was renovated in 2005. 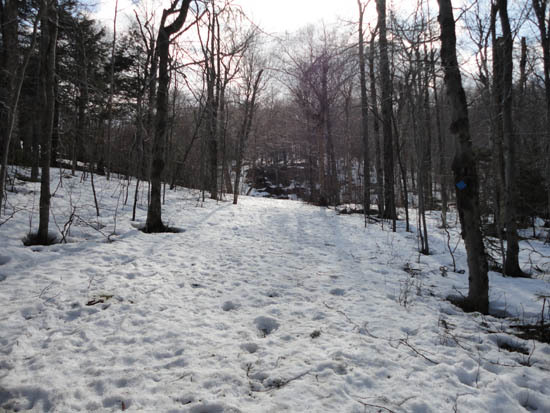 The CCC cut the Alexandria Ski Trail in 1934. Named after trail designer Duke Dimitri von Leuchtenberg, Duke's Trail was cut from the Firescrew subpeak of Mt. Cardigan in late 1933 and improved in 1934 by the CCC. A rope tow served a slope at the bottom of the trail for multiple decades. 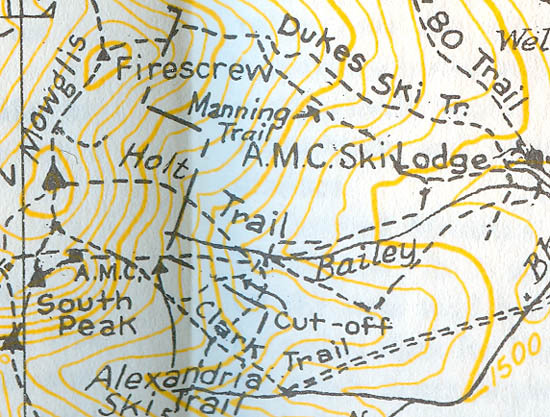 The Appalachian Mountain Club cut the Kimball Ski Trail in December of 1934. There is no known CCC involvement in the design or cutting of this trail. Also known as the West-Side Trail, this is the fire warden's access route to the summit of Mt. Cardigan. There is no known CCC involvement in the designing or cutting of this trail.
" The other new trails are: Two out of Jackson, on Black Mountain and on Doublehead; the Alexandria Trail on the side of Mt. Cardigan; the "Duke's Trail" on Cardigan. " 1. Location - From A. M. C. Cardigan Ski Lodge up E. side of Mt. Cardigan connecting with West-Side Trail. 2. Length - 1.7 mi. 4. Max. Grade - 20-25º. 5. Vertical Drop - 1400'. 6. Exposure - N.E. 12"-15" snow. 7. A trail with enough variety and grade to satisfy the expert - at the same time sufficiently wide to be safe and suitable for the intermediate skier. 1. Location - From A. M. C. Cardigan Ski Lodge to summit of Firescrew on Mt. Cardigan. 2. Length - 2 mi. 4. Max. Grade - 18º. 5. Vertical Drop - 1600'. 6. Exposure - S. and S.E. 8"-10" snow. 7. Very easy trail with gentle grades suitable for the novice. Upper sections are semi-open slopes, good when weather and snow conditions are favorable. 1. Location - From junction of Alexandria and Duke's trails to upper end of open pastures to the S.
2. Length - 1 mi. 4. Max. Grade - 15º. 5. Vertical Drop - 600'. 6. Exposure - N. 10"-12" snow. 7. Trail suitable for the intermediate skier leading to a large open pasture area offering all varieties of skiing. 1. Location - From Orange, 4.5 mi. E of Canaan up the W. side of Mt. Cardigan. Follow road marked "Fire Lookout." 2. Length - 2.5 mi. 4. Max. Grade - 20º. 6. Exposure - W. 12" snow. 7. Lower section for the novice and upper part for the intermediate skier.
" In connection with the A.M.C. Ski Reservation on the E. side of Mt. Cardigan, there are four main trails offering a wide variety. The entrance to the E. side trails is best reached from Cardigan Ski Lodge, in the vicinity of which are excellent open practice slopes of varying degrees of difficulty. To reach the Lodge, turn W. off State 3A at foot of Newfound Lake, and follow A.M.C. signs to end of plowed road. The Lodge is open to A.M.C. members and guests only. Alexandria Trail. From A.M.C. Cardigan Ski Lodge up E. side of Mt. Cardigan connecting with West-Side Trail. Legnth 1.7 m. Max. grades 20º - 25º. A trail with enough variety and grade to satisfy the expert - at the same time sufficiently wide to be safe and suitable for the intermediate skier. Duke's Trail. From A.M.C. Cardigan Ski Lodge to summit of Firescrew on Mt. Cardigan. Length 2 m. Max. grades 18º. Very easy trail with gentle grades suitable for the novice. Upper sections are semi-open slopes, good when weather and snow conditions are favorable. Kimball Trail. From junction of Alexandria and Duke's trails to upper end of open pastures to the S. Length 1 m. Max. grade 15º. Trail suitable for the intermediate skier, leading to a large open pasture area offering all varieties of skiing. West-Side Trail. From Orange, 4.5 m. E. of Canaan, up W. side of Mt. Cardigan. Follow road marked 'Fire Lookout.' Length 2.5 m. Max grade 20º. Lower section for novice and upper part for the intermediate skier. " 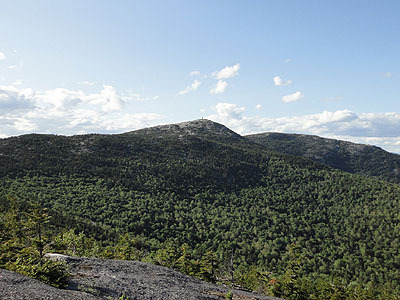 " Mount Cardigan (3,121 feet) rises west of Newfound Lake (eight square miles). 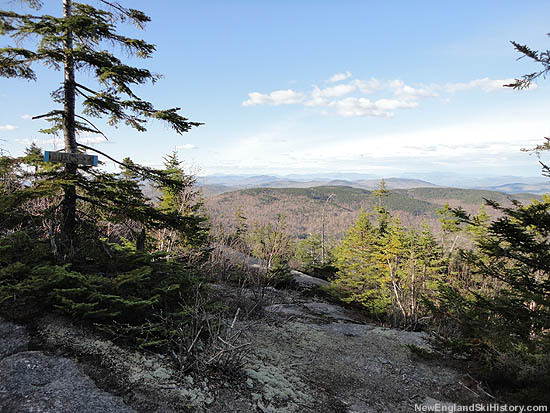 The Appalachian Mountain Club hut (open to members and guests only) is the starting point for the well-known east side trails including Alexandria Trail, 1.7 miles long with a maximum grade of 25 degrees and a vertical descent of 1,400 feet. The hut is about nine miles west of Bristol, partly on a one-lane road. A mountain inn is located near the hut. " " Alexandria Ski Trail. 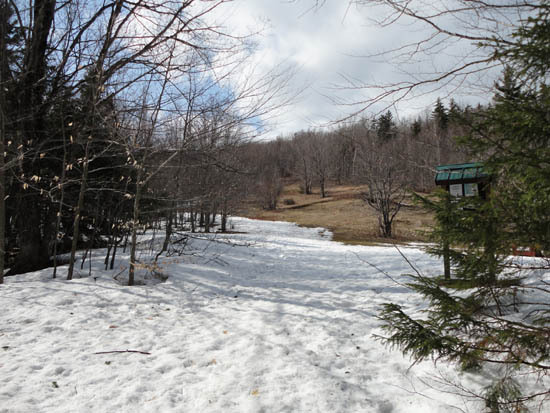 This trail coincides with the Elizabeth Holt Trail to the Bailey Brook crossing, 0.9 m. from the Cardigan Ski Lodge. From here, at the new bridge, the trail follows the old route of the Holt Trail on the S side of the brook for 0.2 m. The two coincide for a short distance to the Holt-Clark Cut-off. here the ski trail rises steeply by a wide curving course for 0.6 m., then crossings a short path near an outlook (P.J. Ledge). Thence, continuing more gradually and joining the Clark Trail at "Washington Outlook," it rises 250 ft. to a point a little below the watchman's cabin. Diverging L here, the ski trail runs level for a few rods across open ledges, drops to the Hurricane Gap Trail and follows the latter about 1/4 m. to the Hurricane Gap Trail and follows the latter about 1/4 m. to the Hermitage, where it connects with the West Side Trail. The Alexandria Trail, from P.J. Ledge to Baily Brook bridge, drops 930 ft. in less than 0.9 m. "
" Duke's (Ski) Trail. 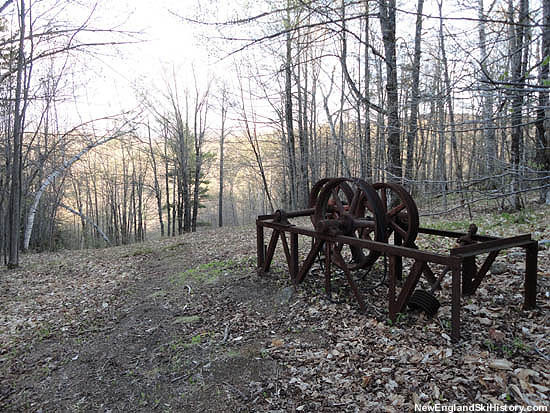 Named for Duke Dimitri von Leuchtenberg, who scouted its location, the main trail leaves the Parking Space beyond the Lodge and ascents, through open pastures and woods, the high ridge that runs E from Firescrew and forums the N slope of Shem Valley. About 1 m. from its beginning, the ski trail joins the old route of the Manning Trail, which it follows for a short distance. It finally emerges on the open ledges of Firescrew. The Duke's Trail is about 1 1/2 m. long; and has an average slope of 8 1/2 and a maximum of 13 1/2 degrees. It is suitable for novice and intermediate skiers. There are serveral exits from the trail to the road other than at the Parking Space. Some of these have slopes of 20 to 30 degrees. " " Kimball (Ski) Trail. Part of the loop which extends from the Lodge to the Clark pastures and returns by the Pasture Link, this trail starts from the road near the Parking Space, goes S across the field, R of the sawdust pile, crosses the Bailey Brook, and ascends diagonally the ridge that forms the S side of Shem Valley, and following a wire fence finally emerges into open pasture slopes, high above the old Clark place. It is 0.8 m. long, has an average slope of 9 and a maximum of 19 degrees; and is suited to novice and intermediate skiers. The section forming the "run" drops 450 ft. in a little over 1/2 m. From the height-of-land an overland route leads W about 1/2 mile toward the mountain, (little grade), and joins the Alexandria Ski Trail just below the Holt-Clark Cut-off junction with the Elizabeth Holt Trail. " " Alexandria Ski Trail. This trail coincides with the Elizabeth Holt Trail to the Bailey Brook crossing, 0.9 m. from Cardigan Ski Lodge. From this point, at the corduroy bridge, the trail follows on the S side of the brook for 0.2 m. The two coincide again for a short distance to the Holt-Clark Cut-off. Here the ski trail rises steeply by a wide curving course for 0.6 m., then crossings a short path near an outlook (P. J. Ledge). Thence, continuing more gradually and joining the Clark Trail at "Washington Outlook," it rises 250 ft. to a point a little below the fire lookout's cabin. Diverging L here, the ski trail runs level a few rods across open ledges, drops to the Hurricane Gap Trail, and follows the latter about 1/4 m. to the Hermitage, where it connects with the West Side Trail. " " Duke's (Ski) Trail. Named for Duke Dimitri von Leuchtenberg, who scouted its location, the main trail leaves the parking space beyond the Lodge and ascends, through open pastures and woods, the high ridge that runs E from Firescrew and forms the N slope of Shem Valley. About 1 m. from its beginning, the ski trail joins the old route of the Manning Trail, which it follows for a short distance. It finally emerges on the open ledges of Firescrew. The trail is about 1 1/2 m. long. There are several exits from the trail to the road other than at the parking space. " " Kimball (Ski) Trail. Part of the loop which extends from the Lodge to the Clark pastures and returns by the Pasture Link, this trail starts from the road near the parking space, goes S across the field, R of the sawdust pile, crosses the Bailey Brook, and ascends diagonally the ridge that forms the S side of Shem Valley, and following a wire fence finally emerges into open pasture slopes, high above the old Clark place. It is 0.8 m. long, has an average slope of 9 and a maximum of 19 degrees. From the height-of-land an overland route leads W about 1/2 mile toward the mountain (little grade) and joins the Alexandria Ski Trail just below the Holt-Clark Cut-off junction with the Elizabeth Holt Trail. " " The Duke's Trail is about 1.25 miles long and is easier than the Alexandria Trail. Leaving Cardigan Lodge on the Holt Trail, the slopes of the Duke's Pasture appear shortly on the right. 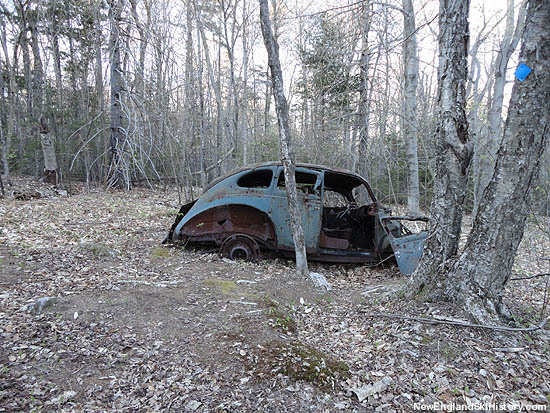 When skiing up the Duke's Trail, you can find the remains of the old rope-tow engine at the top of the pasture; the rusting car chasis from which the engine was taken is on the right. 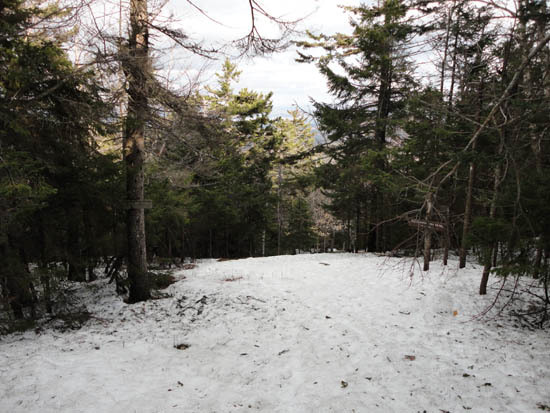 The Duke's Trail is about 15 feet wide with a moderate 20-degree pitch. " " The reward is the Alexandria Trail. It opens up to about 25 feet in width, and drops 800 vertical feet in 0.75 mile. The trail ranges in steepness from 20 to 25 degrees. 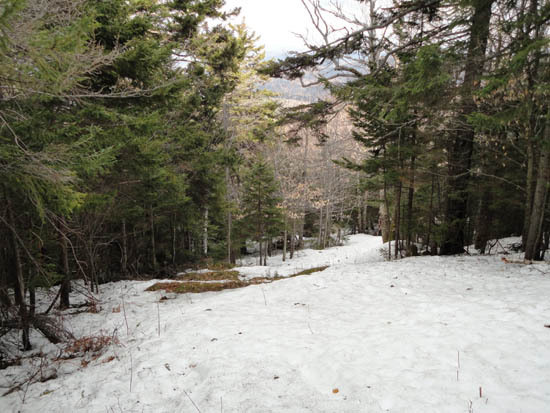 The Alexandria Ski Trail has the characteristics of the best CCC ski trails. It was designed by a skier for skiers. It constantly bends and turns like a restless snake, and often has a sporting double fall line. " Bronski, Peter. "The Cardigan Chronicles: Build It, and They Will Come." Appalachia. Summer/Fall 2009. http://www.outdoors.org/publications/appalachia/2009/cardigan-lodge-history.cfm. Goodman, David. Backcountry Skiing Adventures: Maine and New Hampshire. Boston, MA: Appalachian Mountain Club Books, 1999. New Hampshire Skiing. Concord, NH: State Planning and Development Commission, 1935. "New Hampshire Ski-Land" New York Times. 16 Jan. 1938. Thompson, E. Bigelow. "New Ski Trails Are Built by CCC in the White Mountains" Boston Evening Transcript. 9 Oct. 1934.